Have a look at the picture. What do you see? The tension created between sales and marketing is one of the most well-documented relationships in the B2B environment. When that tension is healthy, it creates an innovative atmosphere where adaptation is encouraged, and customer value is created. Marketing ensures that sales teams provide consistency and context to the evolution of the customer’s long-term needs. Sales teams push back on content development to ensure that individual customers are treated as partners rather than demographic targets. Over the last few years, maintaining alignment between sales and marketing teams has become one of the most complex challenges for B2B enterprises. Today, B2B sales professionals face an environment where the relationship between them and their prospective customer has fundamentally changed. It would be easy to chalk up these changes to the internet and the ease with which buyers can gather information. But it’s not that simple. The digital and social world has changed the buying process too. B2B buyers have new challenges and are under more pressure to make the right decisions in an ever more complex marketplace. B2B marketers understand this, and B2B sales professionals realize that prospects are usually highly educated by the time they connect with sales. Shouldn’t sales trust the content that marketing produces to do more of the initial relationship building? Why are B2B enterprises reluctant to invest in a strategic approach to content? Three words: lack of alignment. Can better alignment between content marketing and sales serve as the key for a broader, more strategic alignment between sales and marketing – and drive more success? In other words, if sales had a better understanding of content marketing — and the role content plays along each phase of the buyer’s journey — could the alignment between marketing and sales improve with frequent collaboration and shared incentives? Conversely, if marketers understood that the funnel they see as a filter is also a gate — and that prospects have personal and unique needs that sales must address — could they deliver more valuable content? CMI’s new research with LinkedIn indicates the answer to those questions is yes. 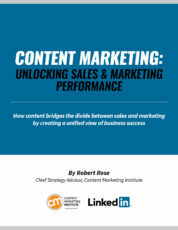 46% report their content marketing and sales teams are highly aligned. 75% of those reporting high alignment have a documented content marketing strategy. 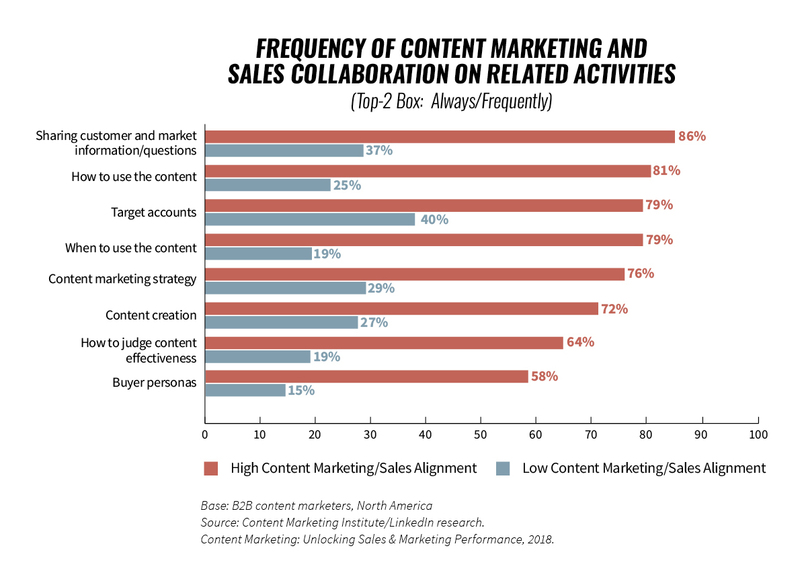 The difference in how often highly aligned and less well aligned content marketing and sales teams collaborate on content-related activities was significant. 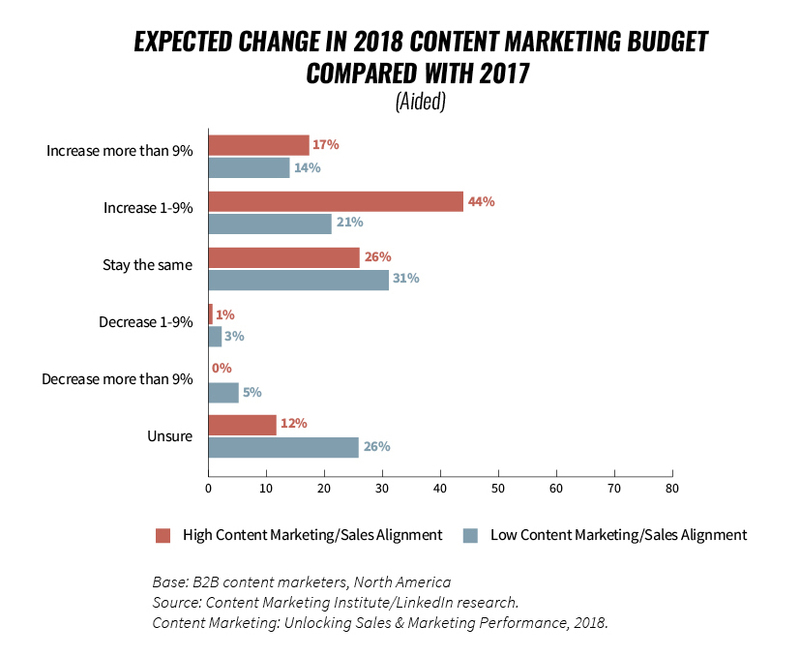 61% of those with high alignment expected their content marketing budget to increase in 2018 (versus only 35% of those with low alignment). There was much higher uncertainty about content marketing budget among those that are less well aligned. This suggests that highly aligned marketing and sales teams are proving the value of their efforts, either through revenue and/or pipeline growth (which they indicated are their top two success metrics), or other ROI metrics. Alignment empowers marketers to build a better case for #contentmarketing, says @robertrose. We not only found ways content marketing can help align sales and marketing, but also uncovered best practices for how misaligned teams can increase their ability to work in concert. You can find the complete results in this white paper. B2B buyers are self-directed. Because of the asymmetry of information, B2B buyers are under pressure to self-educate. Their colleagues and bosses demand it. Today’s buyers feel they can no longer trust sales representatives to educate them on available solutions to their challenges. They have a responsibility to understand the solution set more than any salesperson they speak with. It shouldn’t be any surprise only 12% want to meet in person with a sales representative and 71% start their process with an unbranded search, talking with a sales representative via phone or online chat only when needed. B2B buyers are teams. Today’s B2B buyers are more frequently part of cross-functional buying committees. Almost 70% of companies with more than 5,000 employees have four or more people involved in buying decisions. B2B buyers seek trusted advice among their peers. Today’s B2B buyer uses social media, search, and all manner of digital tools to connect with colleagues, other customers, and industry experts to acquire the information they need. And they are loath to encounter any pushy sales messaging or overt persuasion in the content they consume. The empowered B2B buyer is neither concerned with how your organization is structured and who’s responsible for the content on your website, nor are they interested in talking with a sales rep simply because they downloaded a white paper. Your buyers want contextual interactions with both human and digital assets across a holistic, but non-linear journey. 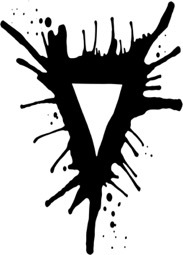 But that brings us back to the inkblot, and the joke about what do you really mean? Marketing and sales professionals in many B2B organizations have fundamentally different views of the customer journey process. Marketing and sales struggle in developing a common vision for the inkblot of the funnel at a broader level. 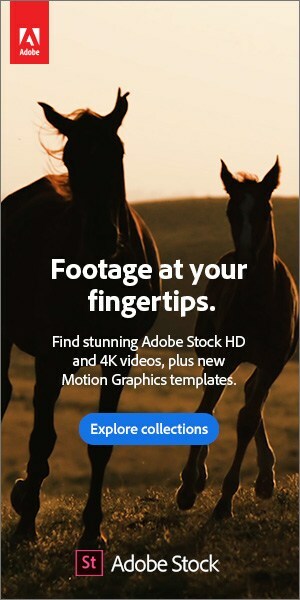 That leaves the strategic content marketing inkblot – still seen as an experiment even within marketing – as an abstract unicorn or butterfly in most B2B enterprises. Over the last decade, CMI has seen content marketing as a practice that provides an innovative approach for B2B companies. 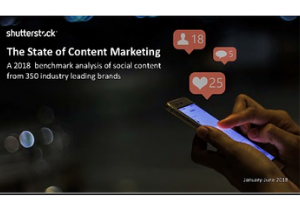 However, in many ways, a consistent, strategic, and scalable approach to content marketing has remained separate, elusive, and mostly ad hoc in many organizations. CMI’s 2018 annual research found that only 20% of B2B marketers say their organizations are extremely committed to the approach of content marketing. And, only 24% say their organizations are “extremely” or “very” successful with the practice. Further, more than half of those B2B marketers say their content marketing consists of a “small (or one-person) team” that serves the entire organization. What are the reasons for such a minimal commitment of investment to content marketing? For starters, when CMI asked B2B marketers if they measure content marketing ROI, 65% said “no” or “unsure.” Without metrics, marketers can’t build a business case for content marketing, which is key to expanding resources needed. From the sales perspective, far too much marketing content goes unused by sales. One reason is because many sales professionals don’t understand their company’s content marketing strategy. And yet the fact remains that most B2B buyers are conducting research on their own, which means they need content – informative, quality content. If a strategic approach to content marketing is taken, it’s more likely that content marketing and sales will collaborate to make sure that type of content is accessible. That collaboration creates better opportunities to create alignment between content marketing and sales, which may also be the key to a broader sales and marketing alignment within the enterprise. We marketing folks may never see the inkblot the same way as sales does. But as long as we are aligned with sales, we can avoid having any, you know, Freudian slips along the way. We hope you find the research valuable. To download the results from the LinkedIn and CMI research – and get started on better alignment between sales and marketing in your organization – click here. Content Marketing World offers an opportunity for sales and marketing to build bridges. Register today using code BLOG100 to save $100. The post Content Marketing and Sales Alignment: Bridging the Gap [New Research] appeared first on Content Marketing Institute.